Wellness is so many things and in my life it spreads into the kitchen. Healthier meal options, reduced cooking and cleanup time and leftovers. WIN, WIN, WIN! May people use their crockpot year around, but for some reason for me, colder months are crock pot time. When I think about why I think it has to do with the time change and it being dark early, so I don’t want to waste daylight cooking. Chili is one recipe I like to make a lot because it gives me a lot of meals I can freeze for easy reheat. But how can you make heavy chili into a healthier version? Easy. Cooking Tip: majority of recipes can turn into healthier versions by simply switching to leaner meats, reducing oils and adding vegetables. 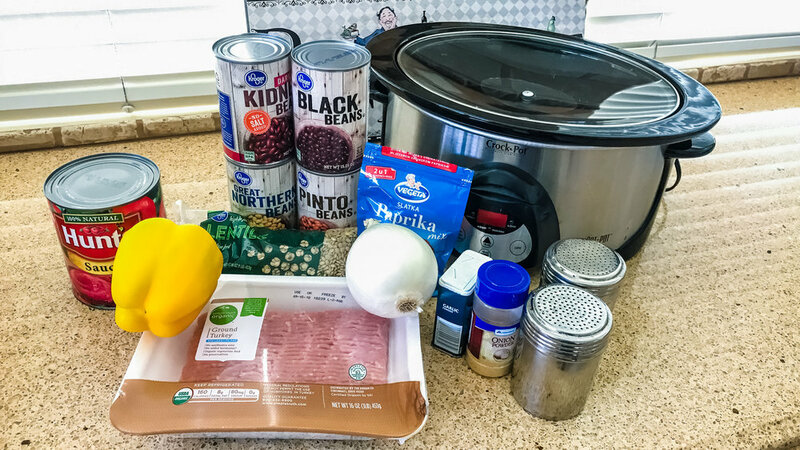 I have tried a lot of chili recipes over the years and altered them until I came up with a list of ingredients to make a healthy version that still satisfies me when I want a hearty meal. This recipe is high in fiber and protein with very little fat content. For my family I will bake some cornbread or serve it over rice, but if I feel I need something more I will cook quinoa for myself and serve chili over it and sometime just add in freshly chopped bell pepper or tomatoes for extra filler. Beans, Beans and More Beans. Well no joke, it is a lot of beans and here they are. Throw it all into your crock pot. Make sure to follow instructions on lentil package and add enough water. Turn crock pot on low or high and cook until lentils are done. All ingredients cooked fast and lentils for me definitely took the longest. 4-5 hours on low should do it, but tase and adjust as needed. Try a new recipe or alter one to a healthier version for more wellness in the kitchen. Be Awesome and Sparkle.